The other day I asked whether anyone had any recipe requests for the coming months, and a few people said they’d like to see some warming soup recipes. 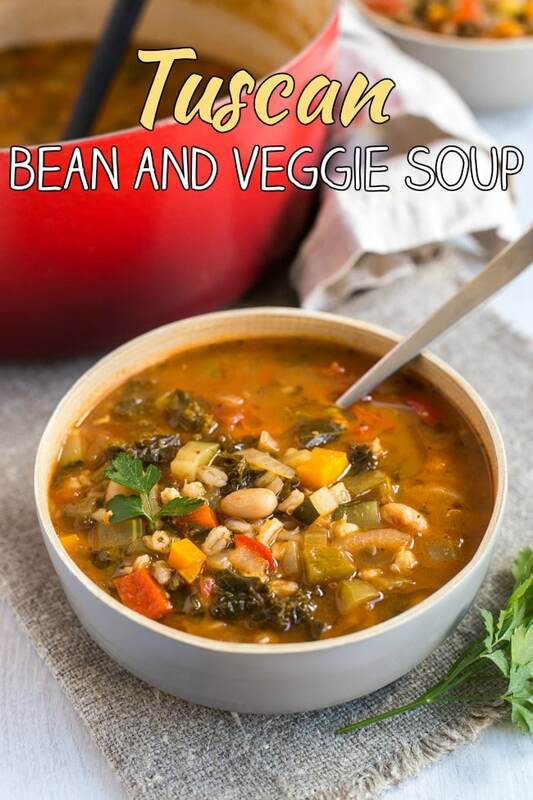 So, I bring you this hearty Tuscan bean and veggie soup! Ask, and you shall receive. Unless you ask for something entirely ludicrous, in which case you probably won’t receive… sorry. But soup, I can do! 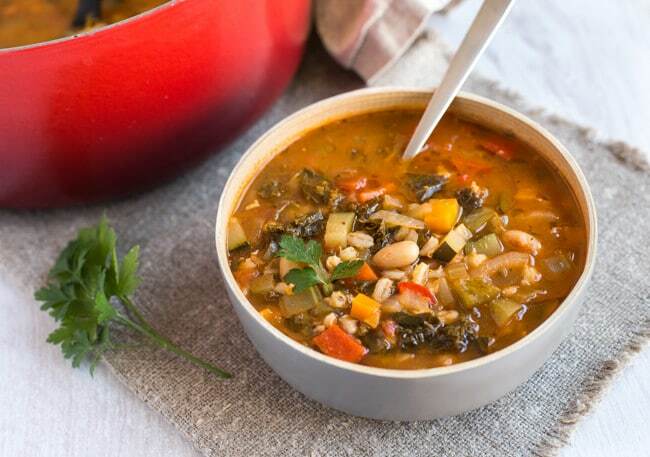 This Tuscan bean and veggie soup is inspired by an Italian dish called ribollita, which is a really hearty soup that’s absolutely jam packed with good stuff. When a recipe uses about 8 different vegetables, you know it’s going to be full of flavour – not to mention full of vitamins. The kind of food that makes you feel great inside and out. 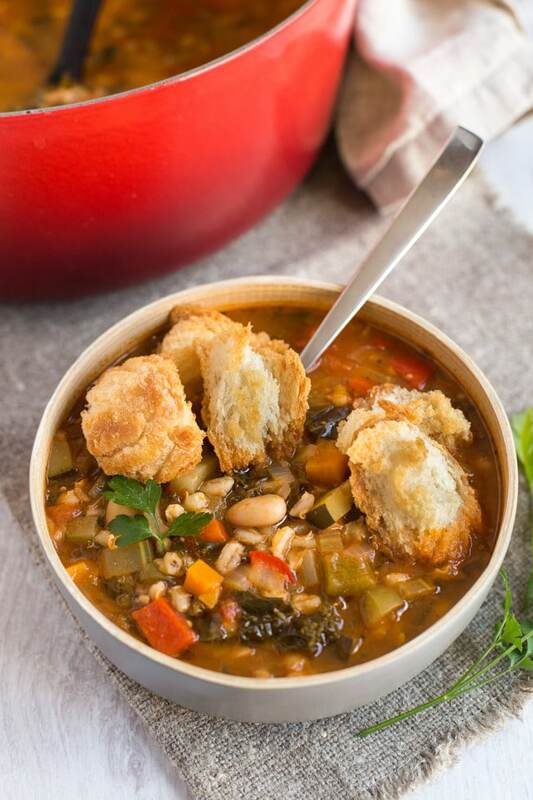 A classic ribollita usually has leftover bread mixed right into the soup, but I kept my bread separate (crispy croutons ftw), and cooked some pearl barley in the soup instead for some extra heartiness. It’s proper comfort food, but it’s healthy too. The perfect combination. 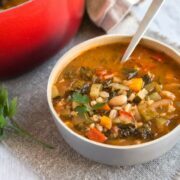 One of the best things about this Tuscan bean and veggie soup is that it’s all made in one pan, which is a huuuuge plus for me – less washing up! I’m sure you can imagine, as a food blogger I do a lot of cooking, which unfortunately means I also create a lot of mess. Pip the pup doesn’t help – our kitchen opens straight out onto our back garden, so she’s always running in and out with mucky feet (luckily her feet are only tiny, much like the rest of her). It just so happens to be Pip’s birthday as I’m writing this (she turns two today, little cutie), so I suppose I should share another picture of her. 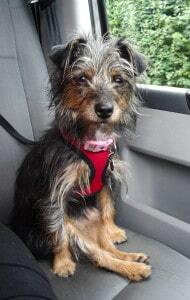 Here she is on a road trip we took over the summer – I love it when she sticks her little feet out like that. She’s spoiled and she’s messy and she’s a nuisance, but she isn’t half cute. Since I know I’m always going to create a ton of mess with my cooking (I don’t even have a dishwasher to load stuff into! Shock horror! ), I always try to start the day with a clean kitchen. Flash products are perfect for making sure everything is spotless before I start cooking. And by the way, their magic erasers are truly magic. When I first bought them I wasn’t sure if they were a gimmick that wouldn’t actually be any more effective than a normal sponge, but actually they’re unbelievably good for tough marks all around the house – kitchen worktops, the hob, even the walls! All they need is a splash of water and they’re good to go. Of course, even if I start with a clean kitchen, I’d still rather not create too much unnecessary washing up for myself… so a one pan meal is my idea of heaven. I busted out my huge heavy casserole dish for this Tuscan bean and veggie soup – things somehow feel even heartier when they’re cooked in one of these rather than a normal saucepan. What are your favourite winter warmers? Don’t forget, if you have any more recipe requests, don’t be shy! Heat some oil in a large saucepan or casserole dish, and add the diced onion, carrot and celery. Cook over a medium heat for a few minutes, stirring regularly, then add the diced peppers, courgette, garlic, and chopped kale. Cook for a further 5 minutes. Add the tin of chopped tomatoes to the pan, along with the drained cannellini beans, vegetable stock, and dried pearl barley. Also add the oregano, thyme, pesto, and plenty of black pepper. Mix well to combine. Cover the pan with a lid, just leaving a crack for the steam to escape, and turn the heat down fairly low so the soup is simmering gently. Allow it to cook, stirring occasionally, for around an hour, or until the pearl barley is soft. If the soup has reduced at all, you may wish to add another cup or two of water at this point, to help is stretch further. The soup should serve at least 4 people, but could serve up to 6 people, if you add some extra liquid. To make the croutons, tear some crusty bread into large pieces, and toss in a tablespoon of oil with some salt and pepper. Bake for around 10 minutes at 190°C (Gas Mark 5 / 375°F), until golden brown and crispy. Serve the soup warm, topped with the crispy croutons, a drizzle of extra virgin olive oil, and some fresh parsley. 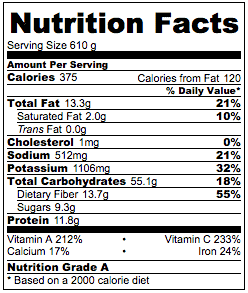 Note: Nutritional information is approximate, and will depend on exactly what ingredients you choose. Information above is for 1/4 of the recipe. 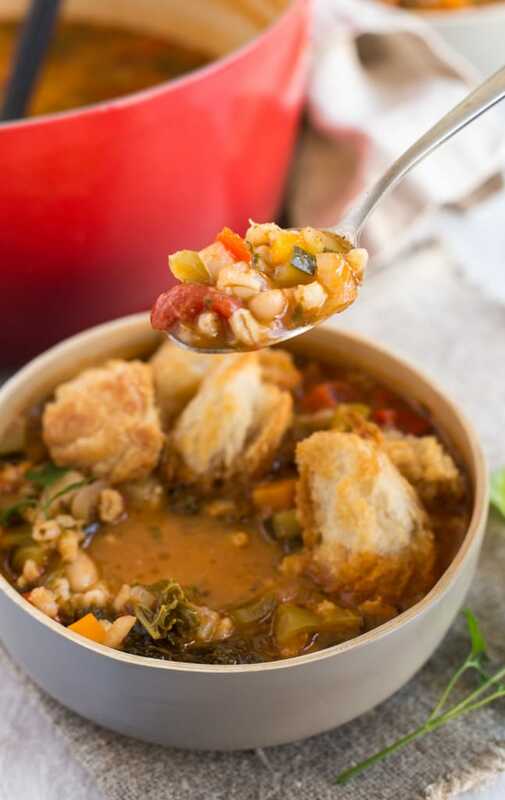 Very nice post, I make my own version of Tuscan Soup ~ it truly is delicious! As a fellow Vegetarian, I would just like to point out that parmesan cheese is NOT vegetarian…so you would either have to make your own pesto, or find pesto that utilizes parma! and/or nutritional yeast. True parmesan cheese is produced according to traditional methods which use calf rennet…Basically rennet is an enzyme used in the process of coagulating milk to turn it into cheese, and it’s usually found in the stomach lining of the newborn ruminants, such as a calf — it helps them digest mother’s milk. You can only retrieve this enzyme after slaughtering the animal. Unfortunately, many people & restaurant owners don’t realize this (I didn’t for the longest time). From now on, read the ingredients of the cheese you pick up, and if it contains rennet — opt for another cheese. There are many cheeses that contain microbial enzymes or bacterial enzymes. If it only states enzymes, then it will be animal sourced. The soup looks absolutely amazing! Happy birthday to Pip. And lol at the ad :) so funny! Firstly, how CUTE is Pip?!!!! Secondly I could tuck into that bowl of soup right now… loving how chunky it looks and really liking the look of those gigantic croutons. Nice work Becca!!! That looks so comforting! I love a chunky bean soup at this time of year and it just goes to show you don’t need meat for a meal to be filling. I really love tuscan bean soup and this one looks great. It’s so good for leftovers and yes, one pan!!! Yummy. Oh that looks really good Becca, love a bit of pearl barley to make a really hearty winter soup. Happy birthday Pip – what a cutie!! 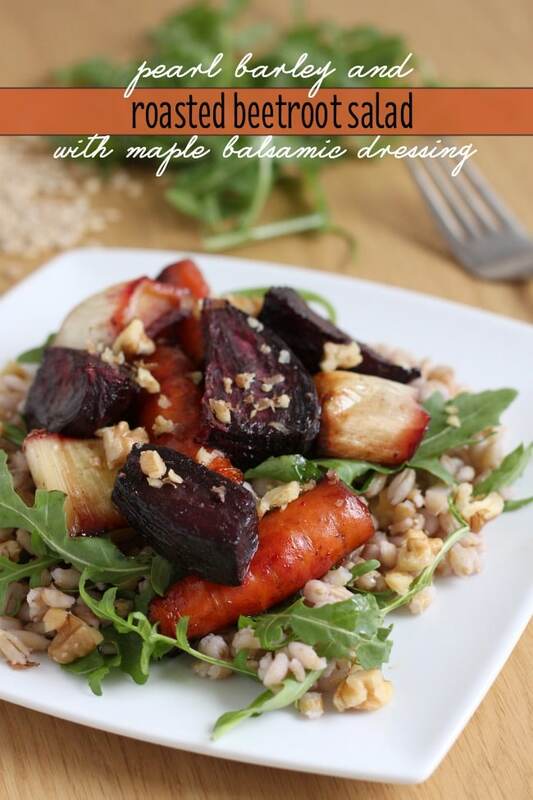 I mostly only used the pearl barley because it’s been lingering in my cupboard wanting to be used, but it worked so well! I love a thick bean soup, proper rib sticking, but still healthy winter food. I could seriously go a great big bowlful of this right now, in front of the tv, please! :) Yum! I think I could use about 50 bowls of this! 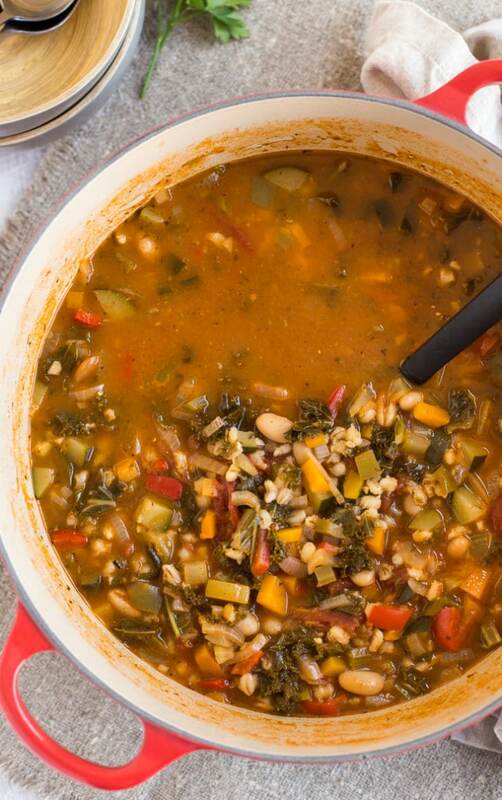 This looks like a hearty & comforting soup. And yes to one pan! That looks gorgeous! I just made a sort of minestrone soup (my take on it!) earlier this week, but it made so much I’ve thrown half of it in the freezer for next week. Just beginning to be soup-ish weather, isn’t it? Those magic erasers are nuts! My wife bought one once, I thought she was ridiculous buying what is basically an expensive sponge, but OH MY GOD was it worth it! Our walls suffer a lot from ‘dirty dog syndrome’, the magic sponge thing sorted that right out! Haha yes they’re good aren’t they! Happy Birthday Pip, may your day be filled with noms and toys and everything you love. My dog Boo has a friend who looks just like the Flash advert dog. Boo whines because she thinks her friend is in the TV. Hi Jackie, I haven’t tried this in a slow cooker but I don’t see why not! You’d need to keep an eye on it the first time you make it though because I’m not sure exactly how long the pearl barley would take to cook in a slow cooker. Haha that’s so sweet, Pip just hates seeing any animals on TV for some reason, even though in real life she’s friends with everyone! Pearl barley takes about four hours on low in my slow cooker. I tend to chuck it in a lot of stuff to bulk things out. Boo only reacts to the Flash dog and Harvey/Sykes on TV fortunately.